From left, faculty members Dom DeFino, Rich Vanderbilt and Harry Bittner. 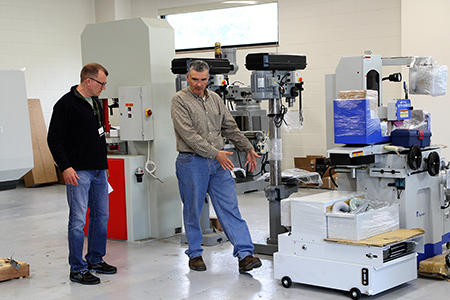 Instructors Harry Bittner, left, and Rich Vanderbilt discuss the lab's layout. The equipment delivery took most of a day to complete. 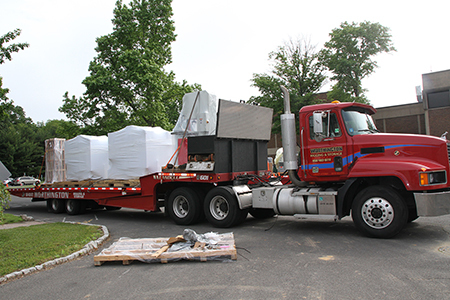 West Windsor, N.J. – May 31 was “moving day" for the Advanced Manufacturing Laboratory at Mercer County Community College (MCCC) with the delivery of a variety of state-of-the-art equipment. Groundbreaking for the building was last August; the new facility is ready to accept students for the Fall semester. According to Dom DeFino, MCCC professor of Electronics Engineering Technology, this kind of training will prepare students for the modern manufacturing environment, a necessity as American manufacturers become increasingly reliant on the use of high-tech equipment that involves multiple, integrated systems. The college has the only facility of its kind in Mercer County, with the next closest facility located in Camden. “It is crucial for manufacturing companies to recruit and employ individuals who know how to operate, troubleshoot, and maintain this equipment,” DeFino said, adding that students will develop skills for apprentice/entry-level positions in shops and manufacturing facilities not only in the local area but across the country. The new equipment includes vertical and horizontal mills, Computer Numerically Controlled (CNC) mills, lathes, CNC lathes, drill presses, vertical and horizontal band saws, surface grinder and power press. 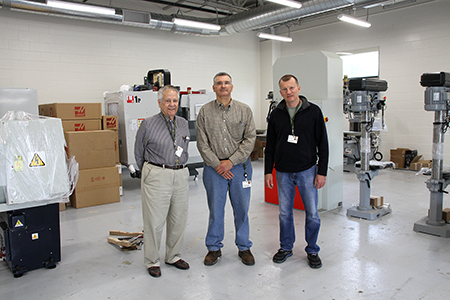 CNC machines have major benefits, observes instructor Rich Vanderbilt. “They can repeatedly create complex parts accurately, no matter how large the quantity,” he explains. The first course, which will be offered this fall, is Industrial Measurements (MET 122). The course curriculum includes shop mathematics and safety, measuring devices, and an introduction to shop drawing techniques. Admission to the program requires a high school diploma (or its equivalent) and one year of algebra or applied mathematics. The $1.2 million, 3,000-square-foot laboratory is the first major construction project on the West Windsor Campus since the Welcome Center was built in 2009. Funding for the project was made possible through the Building Our Future Bond Act approved by New Jersey voters in 2012. For more information, visit www.mccc.edu or email definod@mccc.edu.